Welcome to Friday. We’re kind of in a crunch today. We saw a midnight showing of Funny People last night. Are we getting too old for that soon? Probably not. Now we’re working an AC/DC concert tonight. None to thrilled. We’re not fans. Oh well, we’ll try and work something out for today. For now, shoot to thrill. It’s Thursday. Get here soon, Friday. Part 2 of our Mike Lange interview is up Friday. Funny story, I had finished the transcribing of it and decided to split into two parts. So I copied it to eventually be pasted. But then, I accidentally (being the idiot I am) copy-pasted another image and therefore lost all that material. I would have to transcribe it all over again. 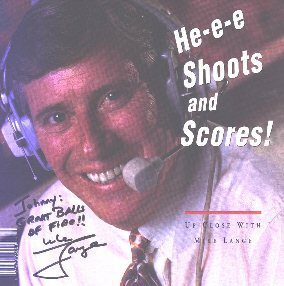 But it was worth it, if only because Mike Lange is such a terrific storyteller and all-around hockey treasure. I sure hope you like reading it as much as I enjoyed hearing it. Now on with the day. There’s nowhere to hide. Let us start out by stating this: we may be the first to interview legendary Pittsburgh Penguins play-by-play man Mike Lange without mentioning the Jean-Claude Van Damme film Sudden Death in which he and Paul Steigerwald appeared as themselves. We are sorry, but we try not to ask questions that we’ve heard before… so that counts. From the e-mail exchange and the responses Mr. Lange sent to us, it is 100% certain that he is a class act all the way. Please read this entire thing. 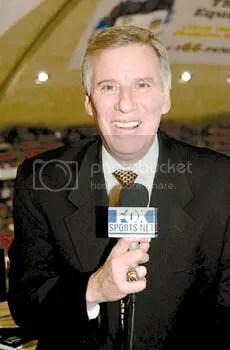 If every person we interviewed, and this is nothing against any of our previous guys, put as much detail into these as Mike Lange has done (and previous subjects such as Jack Edwards and Joe Beninati did) we could (and maybe would) publish a book of all of these. Gosh, what wonderful information this is to have as a college student wanting to get into this business. Simply fantastic. In part one of our discussion he tells us about, after the jump, his entry into the hockey world, Lemieux and Crosby, what he thinks of Randy Moller, and a bunch of other stuff that’ll leave Penguins fans and general puckheads alike smilin’ like a butcher’s dog. We know we were. Name the least appealing game on the NHL schedule for the 2009-10. We want to see if it shows up on the national television schedule. We have an interview being posted today, so it’s time to get Grandma into the fastlane, the bingo game is ready to roll. Now let’s go. Make up something to believe in your heart of hearts. Every year, each of the EA Sports franchise games has their own sort of sound. From FIFA’s combo of world music and techno, to Madden’s running around the “Top 40” gamut. The NHL has a weird mix of modern-day alternative rock, which is essentially punk, indie rock, metal and the despicably genre of bro-rock. Oh, and “Rock You Like a Hurricane”. Here is this year’s soundtrack to NHL 10. You can find all the EA Sports soundtracks here. Good morning. Definite discussion of the Islanders situation today. Perhaps more. Enjoy the day. Let’s make the donuts. Didn’t we have some standards once?